I love the look and texture of hydrangea flowers. When a fellow SU Demonstrator (www.craftymariasstampingworld.blogspot.com) made a card with hydrangea flowers, I had to try making them, too, and my results are shown above. The petals are made using the Stampin' Up Full Heart Punch. I went online to find Valita's Design and Folds easy-to-follow tutorial. Valita has a wide range of tutorials, showing how to use all kinds of punches to make three-dimensional embellishments and flowers. Living in England, hydrangeas are very popular in the summer, and I think they will always remind me of Keepers Cottage (where we lived from 2000-2002). We used to have the most amazing vibrant pink hydrangeas growing in our front garden, which you can see in the photo below. 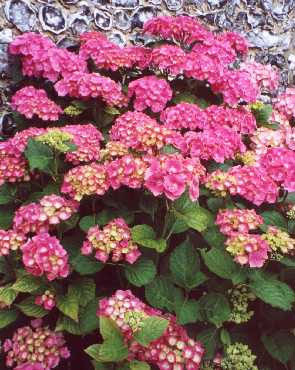 As gardeners know, the chemical of the soil will determine whether the hydrangea is pink or blue. I love hydrangeas! I love Valita's site too! Thanks for the link, your flowers are gorgeous!